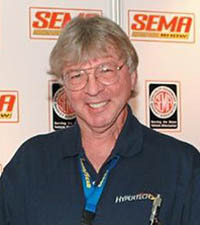 SEMA Hall of Fame - Mark Heffington, 2012, Hypertech Inc..
Mark Heffington was born October 2, 1941, in his grandmother's home in Memphis, Tennessee. As a fifth grader, he enjoyed helping out in the school library, where he became inspired by three car books, The Modern Racing Engine, a technical book published in late '40s, and two fictitious novels, Hot Rod and Street Rod, both written by Henry Gregory Felsen. By the time he was 15, he had his mother taking him and friends to local drag races. Hooked on cars, Heffington pursued a degree in mechanical engineering from the University of Tennessee and then began his career in the aftermarket industry as the chief cam designer for Crane Cams. In 1972, he founded Cam Dynamics, a leading manufacturer of high-performance and racing camshafts. In the early '80s, he sold the company and began consulting on camshaft design and engineering for United Technologies and General Motors. "I felt like John Belushi at the Triple Rock Church when he had seen the light," Heffington recalled. "In a matter of seconds, I knew exactly what I wanted to do and saw the opportunity. And then you just go and do it." Heffington poured himself into research and exploration. He founded Hypertech Inc. in 1985 in Bartlett, Tennessee, and engaged engineering consultants to help with computer programs and reverse engineering of codes to develop aftermarket onboard computer reprogramming devices. 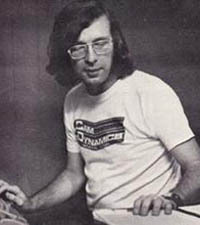 In 1986, he introduced the first Power Chip to recalibrate the early automotive computers that used replaceable PROMs or "chips" in their electronic control modules. In 1994, with later generations of electronic control units eliminating such chips, Hypertech kept pace, releasing another first, the Power Programmer to access and alter the "flash" programmable memory associated with the newer OBD-II technology. In fact, during Hypertech's early years, the company cornered the market on such products, chiefly because few manufacturers understood the technology as Heffington did. 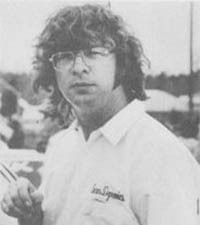 Heffington's pioneering contributions to the aftermarket and racing communities brought him induction into the Hot Rod Hall of Fame in 1997. His company also became a five-time winner of SEMA Best New Performance-Street Product and Best Engineered Product awards and a two-time Popular Mechanics Editor's Choice award winner for product innovation, among other industry accolades. In addition, he currently serves on the SEMA Political Action Committee, lending his considerable industry experience and expertise to the efforts to favorably shape public policy to the entire aftermarket's benefit. In fact, since his successes in the '90s, Heffington continued to demonstrate zeal and innovation for the industry. Heffington took an early stand with his company, creating only street-legal products that met emissions standards. In 2009, Hypertech introduced the Sport Power Programmer, the first street-legal line of tuners for imports. "The reason I started Hypertech was for people just like me," he explained. "People who like to drive a high-performance street car every day of their life." Over the years, onboard computer controllers have become more and more sophisticated, regulating fuel, spark, transmission and even radiator cooling fans. However, Heffington views that less as a challenge than an opportunity for even more performance gains. In its 27th year (as of 2012), Hypertech remains a leader of engine tuning products, and Heffington continues to look to the future, seeing better ways to control highly modified engines equipped with nitrous, cam changes or superchargers as well as the ever-changing production models.